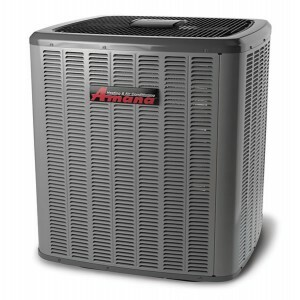 While the energy-efficient performance and reliability of an Amana® brand ASZC18 Heat Pump will validate your purchase decision with dependable indoor comfort for years to come, it’s the venerable Amana brand name that lets you be confident today. From our world-class engineering and comforting craftsmanship to our legendary limited warranties* and many other distinguishing factors, buying Amana brand means you can be certain you made the right decision. ComfortNet™ Communicating Systems Compatible – Continuously monitors system performance and allows remote control of system as an option. LCopeland® CoreSense™ Diagnostics – Advanced diagnostics constantly monitor your heat pump system, reducing failures and pinpointing trouble spots for a fast fix. SmartShift™ Technology – Specialized time-delay defrost technology allows for a reliable, quiet and smooth transition when units enter defrost mode. Heavy-Gauge, Galvanized Steel Enclosure with SoundControl Top – A louvered cabinet protects the coil, while its appliance-quality, post-paint, baked enamel finish protects your system from outdoor elements.